MITSS (Medically Induced Trauma Support Services) is a non-profit organization whose mission is to support healing and restore hope to patients, families, and clinicians impacted by medical errors and adverse medical events. Their website was created in order to share tools which they have developed in pursuit of their mission. Clinician support has been a cornerstone of the MITSS mission since their inception in 2002. Over the past couple of years, MITSS has witnessed more and more organizations around the country recognizing the importance of supporting their clinicians and staff following adverse events. As this cultural shift is happening, healthcare organizations are asking "how" to do a better job at supporting their clinicians and are looking for concrete tools and resources to assist them. MITSS assembled a group of prominent healthcare leaders, researchers, and clinicians who are already doing some of this work in their own institutions. Together, they have developed a toolkit for organizations to use regardless of where they are on the spectrum - from those in the early stages of looking at different support models to those who may already have programs in place. Workplace safety is inextricably linked to patient safety. Unless caregivers are given the protection, respect, and support they need, they are more likely to make errors, fail to follow safe practices, and not work well in teams. 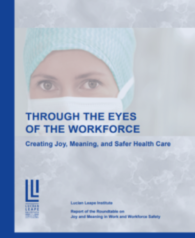 A new report from the Lucian Leape Institute looks at the current state of health care as a workplace, highlights vulnerabilities common in health care organizations, discusses the costs of inaction, and outlines what a healthy and safe workplace would look like. The report concludes with seven recommendations for actions that organizations need to pursue to effect real change.